Zanussi washers are reliable and strong, but require regular maintenance and careful handling. If your Zanussi washing machine doesn’t work or cannot perform some of its functions, it’s time to perform a troubleshooting process. Don’t rush to contact the nearest customer service center – there’s no need to spend money and time when you can do everything on your own. 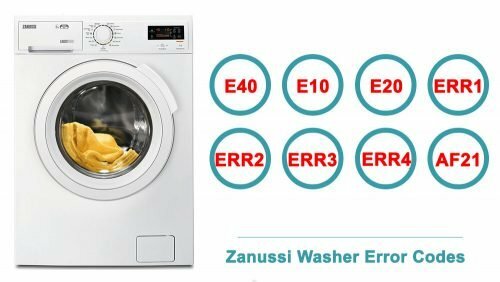 Below, you will find detailed information about repair and maintenance of different models of Zanussi washing machines. For better comprehension and understanding, they are present in the form of tables. They enlist the most widespread technical problems, factors that cause them, and methods of elimination. Whenever you face some problem, you can find the solution in the tables below. When a Zanussi washer has some technical problem, it will inform you by displaying an error code on the screen. You don’t have to reach the printed manual to define the issue – the tables include the error codes with explanations and ways to fix issues. If the model of your Zanussi washer isn’t mentioned below, the guide for a machine from the same series can be applied. The instructions are suitable for an average user: they are easy to follow. However, in some cases, professional help is irreplaceable. If the washer doesn’t work due to serious mechanical damage, or there’s a software failure, you won’t be able to repair it without a service center. Don’t hesitate to call repairmen. the water network has been cut off. The "End" light flashes 10 times The flaps of the drum door are opened. Err 01 The start/pause light blinks. The door is not shut properly. Shut the door properly so that you hear the click. If the problem persists, turn off the machine unplug and apply to the nearest authorized service immediately. Err 02 The program ready light blinks. The water level in your machine is below heater. The pressure of your water supply may be low or locking. Turn on the tap to the end.Water may be cut, check it. If the problem is still continuing,your machine will automatically stop after a while.Unplug your machine, turn off the tap and apply to the nearest authorized service. Err 03 The start/pause light and program ready light blinks . The pump has failed or the pump filter is obstructed. Clean the pump filter. If the problem persists,apply to the nearest authorized service. Err 04 The program end light blinks. Communication error Shut down your machine and unplug. Turn off your tap and apply to the nearest authorized service. Err 05 The start/pause light and program end light blink. The heater of your machine or the heat sensor has failed. Err 06 The program ready light and program end light Wink. The motor has failed. Err 07 The program start/pause light, ready light and program end light stays on permanently. Configuration error. Err 09 The program ready light and program end light stays on permanently. The network voltage is too high or too low. If the network voltage is lower than 150V or higher than 260V, your machine will automatically stop. When the network voltage is recovered, your machine will continue its operation. The display shows Err2 If you want to set a new programme, deactivate and activate the appliance. Error code E40 is displayed in the display windows - the cover is not correctly closed. Error code EAO is displayed in the display windows - the flap s of the drum door are opened.